How Outsourcing Trends Shaping the 2020 Market? We know that outsourcing is one of ever-growing industry and is a part of your software development for its feature advancement. The main thing that to focus on is, does outsourcing come with better or worse quality? It entirely relies upon current outsourcing trends and which IT company you contract with to take the necessary steps for your application. If you pick the wrong one and it will misuse your cash by carrying a procedure. But if you choose the correct one, then it will demonstrate certainly. Not only money related expense but rather the cost of time, glitches, delays, security issues among others problems. With the wrong company, not your project deadline will extend, but you will get bugs in it. With the right outsourcing team, you can eliminate this. The right IT organization put time and effort behind your application development. How to select right company for software outsourcing? The software outsourcing trends leaders have seen clear growth in the company while saving 40 to 60% income. Software outsourcing helps to complete your project faster with hiring potential developers, from an IT company. You can research with them about their past work and what they gained from those encounters and undertakings. Pick a right company that is centered on the quality and the accomplishment of your product and at last your business. 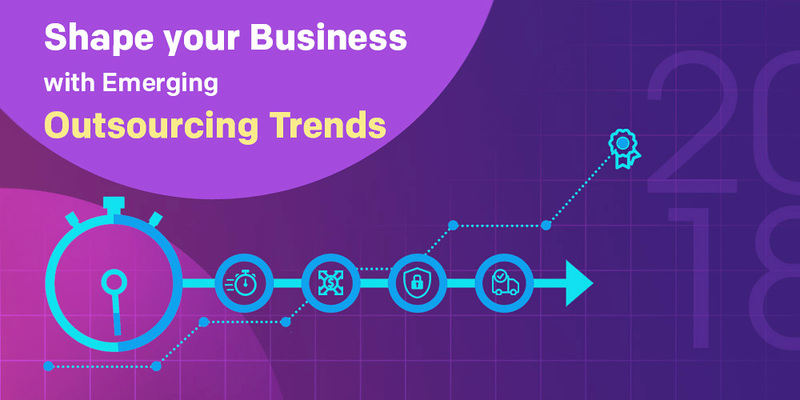 How to find software outsourcing trends? To ensure the latest outsourcing trends, all you have to do is to check the following things. To make your global outsourcing presence easier with making a list of all the services you need from the Outsourcing project. Here you have to ensure that you don’t end up with the freelancing developer. This might be cheaper, but at the end of the day, you won’t get your needed time. Some of the things you should take care before outsourcing. Reputation – IT Company should be well reputed. A well-known Software company will have 20+ year of experience in the market. This shows their trust and services they are expert in. You can define the reputation of the company by going through some of their past work and portfolios. Test & interviews – Never trust anyone always ensure you are working with the dedicated team. Take interviews, and give the team a qualifying test so you can be sure about the project quality. Compare competitors – There are numbers of the IT Company in the market who communicate in many possible ways and signed with one that can win your trust. Things to consider when you’re hiring a software outsourcing team? Development team – Make sure you have a complete team which includes the project manager, senior developer, junior developer, and necessary people to complete the project. And don’t forget to interview them all. Security team/Network department – This is one here is very serious, with the growing number of internet user one can always face problems like internet break down, server error and lot more. But big IT companies have their network teams. This can eliminate all the mention errors. It ensures your application will always be online. QA team – Testing teams can help you to ensure application without having any bugs. They can work as a beta tester. QA team will help to find possible errors in the application. They are expert in finding the bugs, so you don t have to worry about the app when it lives. Support and maintenance –If you want your application to run without errors and make the user experience friendlier, then make sure you are dealing with a company that offers 24*7 support and maintenance. In this kind of situation, finding a freelancer can be a tough job. Quality service – Company that provides outsourcing services has larger portfolios and a highly experienced team with providing all the IT services. You can rely on the company. Not only developers are looking after your project but also the testing team and project manager. It assures you the end quality. All in solution – The outsourcing company offers you all the services you need to maintain your online business. From the digital marketing to high-end technology development you will have your needs served less than one roof. So you don’t have to worry about finding experts for different services. Cost effective – Here you don’t have to invest your money in HR, account team, or any other person. When you outsource your project all you have to do is select a group, you need, and the service provider will take care of everything. Different models of outsourcing – you can choose from the hourly based model where one can only pay for services which are given by the developers, project-based model, fixed price model, or dedicated team model. You will have a complete team working for you as an in-house team. They are flexible as you want. It can save up to 60 to 40% income. Focus on your business – When you are passing on your IT management to a trusted company, you will have more time to focus on another aspect of the business. IT outsourcing trends Gartner will ensure you 100% guarantee on the management of the project. Although there are several firms which determine a long-lasting success so you need to consider the dynamic and ever demanding environment. If you’re looking for a reliable and cost-effective offshoring service provider then there no need to look further. Get in touch with us today!